What do you do with EL Wire? It is a length of colored wire with a small, black, plastic battery box, called an inverter, on one end. There is a connector on the end of the EL wire section, that plugs into a matching connector on the inverter. The inverter is just a small, black, plastic box that holds the battery, and turns the wire on and off. The inverter has a switch that turns the wire on steady, or if switched in the other direction, makes the wire blink. The inverter battery lasts a long time before you have to change the battery. The 3 foot length uses one AAA battery which is the most compact unit available for this length. The 5 foot length uses one AA battery, also the smallest package for this length of wire. The 20 foot wire uses one 9 Volt battery, and has a dial to control the blink speed, and another dial to control the brightness. The 20 foot inverter can be operated from 120 Volt house current with the optional AC adapter. 3 feet of wire uses an inverter that uses one AAA battery, and is 2 x 1.2 x 0.6 inches, or 51 x 30 x 14 mm. 5 feet of wire uses an inverter that uses one AA battery, and is 2.2 x 1.3 x 0.7 inches or 56 x 33 x 18 mm. 20 feet of wire uses an inverter that uses one 9 V battery, and is 2.4 x 2.4 x 1.2 inches, or 62 x 60 x 30 mm. The wire is flexible, is covered with plastic, and is 2.2 mm in diameter. You can wrap it around things, stick it in your mouth, and even tie it in loose knots. If you kink it very sharply, it will eventually short out, and you may have to cut off the shorted out part. You can bend it, but if you bend it sharply in the same place over and over, it will eventually go bad in that place. 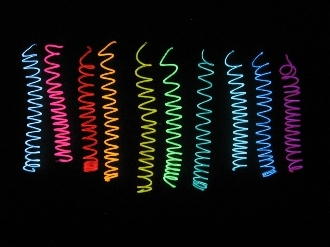 The glow from EL wire is not bright enough to be seen in bright sunlight, so it is best for nighttime situations. Looks great in nightclubs, raves, Burning Man, Halloween, proms, and cocktail parties. It is tons of fun! Colors available are: Red, Orange, Yellow, Lime Green, Green, Blue/Green, Blue, Purple, White, and Pink. Available in lengths of 3 feet, 5 feet and 20 feet. Inverters are included, but batteries are not. We also sell custom lengths, and can custom order many other inverters. We do make custom costumes, too. Great reusable glow for Electic Run!